You can add shortcuts to internal command by right-clicking a dock, Shelf tab or NextSTART menu, and then selecting 'Insert New Item' followed by 'Internal Command' from the context menu that pops up. For convenience internal commands are normally categorized into seven individual groups ([Application], Desktop, Media, Disc, Misc, System and Shutdown) but the full list of available internal commands is shown below in alphabetical order. Action Center Opens the Windows 10 Action Center panel. Add New Hardware Opens the Windows Device Manager dialog. Add New Printer Opens the Windows Add Printer dialog. Add-Remove Programs Opens the Windows Programs and Features dialog. 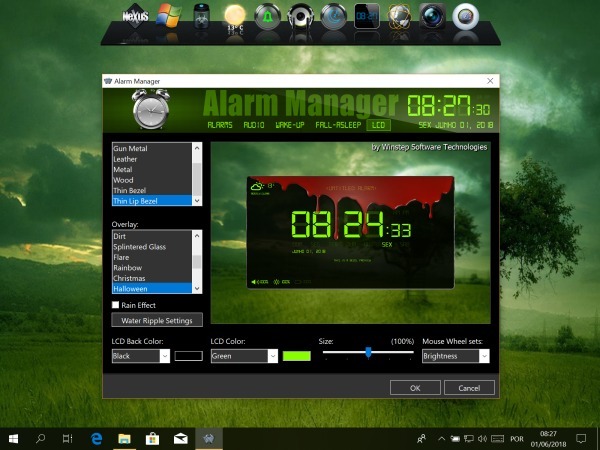 Alarm Manager Opens the Winstep Alarm Manager dialog. Auto-Backup Settings Backups all application settings with automatically generated filename. Backup [Application] Settings Backups the application settings. Bring [Application] Forward Brings all application related objects to the foreground. 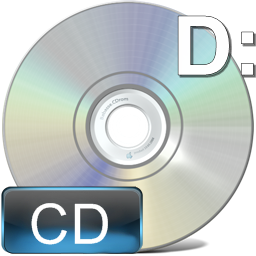 CD Control Shows inserted media type and opens/closes the CD drawer when clicked. Capture Desktop Saves a screenshot of the desktop as a JPG or PNG file. Cascade Windows Cascades all windows. Check for Updates Checks for the existence of newer versions of the application. Clear Recent Documents Clears the Recent Documents list. Connect to the Internet Initiates a Dial-up connection. Control Panel Opens the Windows Control Panel. Date & Time Properties Opens the Windows Date and Time dialog. 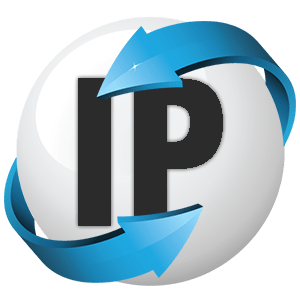 Disconnect Modem Terminates a Dial-up connection. Display Properties Opens the Windows Display Properties (Personalization) dialog. Empty Recycle Bin Empties the contents of the Recycle Bin. Exit Winstep Xtreme Exits all Winstep Xtreme applications after confirmation. Exit [Application] Exits the application after confirmation. Fast Boot Toggles Fast Boot (start at the same time as the Windows desktop). Game Controllers Opens the Windows Game Controlers dialog. Hide All Hides all docks, fades out all open desktop modules and collapses the Shelf. Hide Desktop Icons Hides all desktop icons. Hide Taskbar Hides the Windows taskbar. Hide/Show Desktop Icons Toggles the visibility of desktop icons. Hide/Show Taskbar Toggles the visibility of the Windows taskbar. Internet Options Opens the Windows Internet Properties dialog. Keyboard Opens the Windows Keyboard Properties dialog. Language Bar Displays and switches current language and input methods. Lock Computer Displays the Windows Login screen. Log Off Logs off the current user after confirmation. 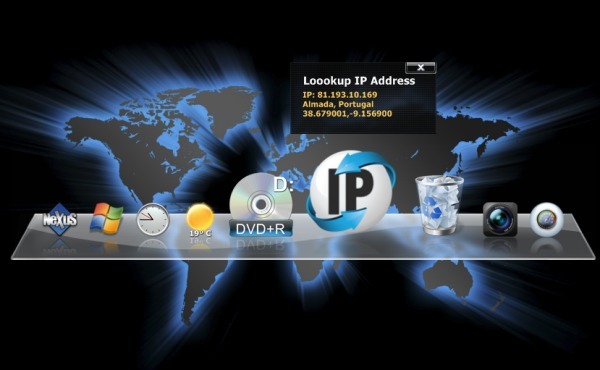 Lookup IP Address Shows the external (web) IP address and user's geographical location. Media Next Skips to the next track if Media Player is open. Media Pause Pauses the track/video if Media Player is open. Media Play Plays the media if Media Player is open. Media Player Runs the built-in Media Player. Media Previous Skips to the previous track if Media Player is open. Media Stop Stops playing the media if Media Player is open. Media Volume Down Lowers media volume if Media Player is open. Media Volume Up Increases media volume if Media Player is open. Minimize All Windows Minimizes all open windows. More Themes Opens the Winstep Themes page in the default web browser. Mouse Properties Opens the Windows Mouse Properties dialog. Multimedia Properties Opens the Windows Sound dialog. My Computer Opens the My Computer dialog showing all disk drives. Network Neighbourhood Opens the Windows Network Neighbourhood dialog. Network Properties Opens the Windows Network Connections dialog. ODBC32 Data Admin. Opens the Windows OBDC Data Source Administrator dialog. Peek Desktop Uses Aero in Windows 7 to peek at the desktop. Power Management Opens the Windows Power Options dialog. Power Off Monitor Powers off all monitors. Power Saving Mode Toggles power saving mode (None, Normal, Ultra) to save battery. Printers Opens the Windows Printers dialog. Quick Exit Winstep Xtreme Exits all Winstep Xtreme applications without confirmation. Quick Exit [Application] Exits application without confirmation. Quick Log Off Logs off the current user without confirmation. Quick Restart Windows Restarts Windows without confirmation. Quick Shutdown Windows Shuts down the system without confirmation. Recycle Bin Shows the contents of the Recycle Bin. Regional Settings Opens the Windows Regional Settings dialog. Restart Windows Restarts Windows after confirmation. Restore All Windows Restores all minimized windows. Restore Wallpaper Changes the wallpaper to the one used before a Winstep theme changed it. Restore [Application] Settings Restores the application settings. Run Opens the Windows Run dialog. Search Opens the Windows Search dialog. Show Desktop Hides all open windows, equivalent to pressing WIN+D. Show Desktop Folder Opens the contents of the desktop in a Windows folder. Show Desktop Icons Shows desktop icons if previously hidden. Show Fonts Opens the Windows Fonts dialog. Show Taskbar Shows the Windows taskbar if previously hidden. Show Tip of the Day Opens the Tip of the Day dialog. Show Volume Control Opens the Windows Volume Mixer control. Show Windows Side by Side Shows all open windows side by side. Show Windows Stacked Stacks all open windows. 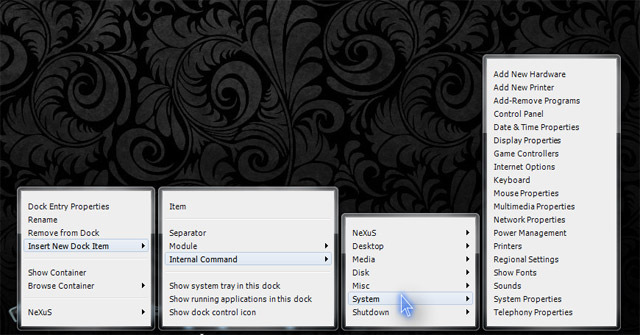 Show/Hide Desktop Modules Toggles visibility of desktop modules (Winstep Xtreme only). Shutdown Windows Shuts down the system after confirmation. 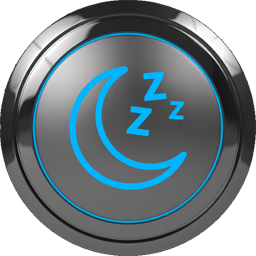 Sleep Makes the computer enter Sleep Mode. Sleep Timer Opens the full screen sleep timer alarm to fall asleep with music. Sounds Opens the Windows Sound dialog. Start Flip3D Invokes the Windows 7 Flip3D function (Windows 7 only). Start Menu Opens the Windows Start Menu. Start Screen-Saver Runs the screen-saver. System Properties Opens the Windows System dialog. Task Manager Opens the Windows Task Manager. Task View Opens the Windows 10 Virtual Desktop Manager. Telephony Properties Opens the Windows Phone and Modem dialog. Version Info Opens the Version Info dialog for the application. WinAmp Preferences Opens WinAmp Preferences if WinAmp is running. WinAmp Show Equalizer Opens the WinAmp Equalizer if WinAmp is running. WinAmp Show Playlist Opens the WinAmp Playlist if WinAmp is running. Windows Help Shows the Windows Help dialog. [Application] Help Opens the Help file for the application. [Application] Preferences Opens the Preferences screen of the application. The built-in Alarm Manager is so powerful that it could easily be sold as a stand-alone application at this point. Besides its ability to pop-up reminders with audio, it is also a full blown task scheduler featuring some very flexible scheduling abilities. The Alarm Manager icon appears grayed out if no alarms are currently defined or active. The balloon tooltip of the icon describes the next alarm that will activate (if any). 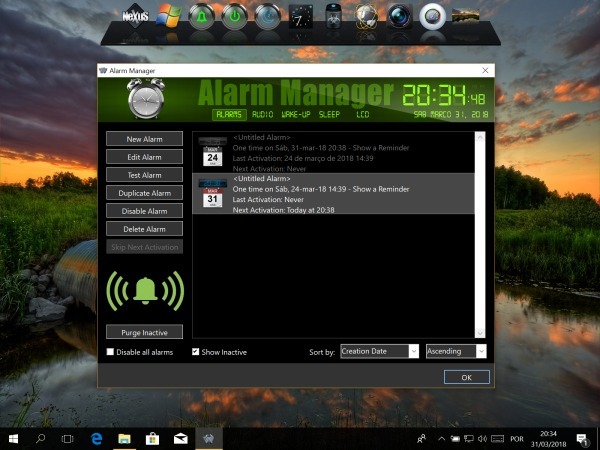 Clicking the Alarm Manager icon opens the Alarm Manager window from where alarms can be managed and alarm settings defined. 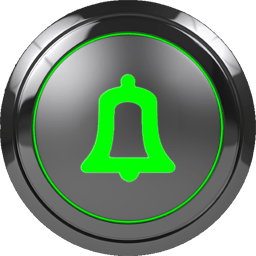 In the main tab you can create as many alarms as you want, test them, edit alarms, duplicate alarms, delete alarms, disable alarms and purge all inactive alarms. 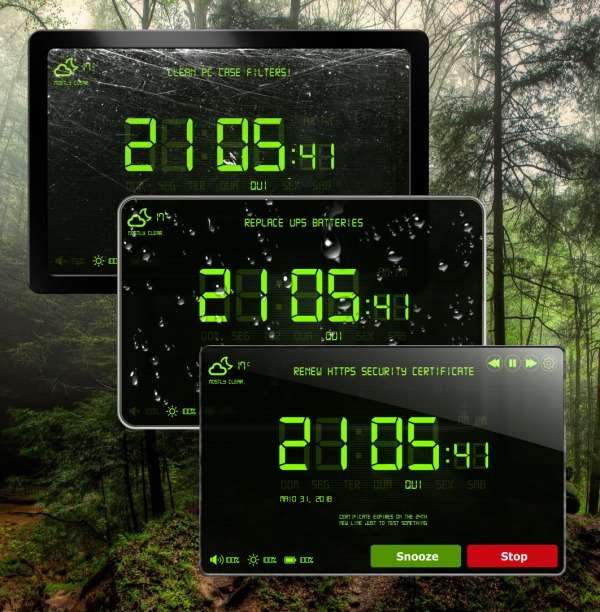 Alarms can be filtered and sorted by creation or activation date. You can also temporarily disable all active alarms. 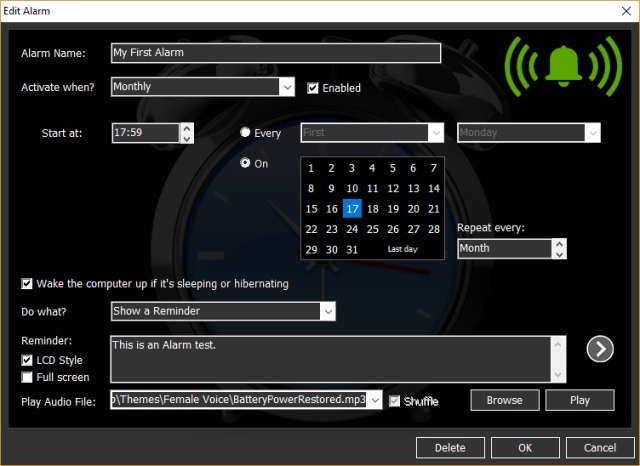 The Alarm Editor panel allows you to create One Time, Daily, Weekly, Monthly and Yearly alarms, with multiple and flexible schedule options. You can use alarms to pop up reminders, run applications and even run other internal commands. Alarm reminders can be made to play single audio files or whole playlists when they pop up. You can create and manage your own playlists in the Audio tab. 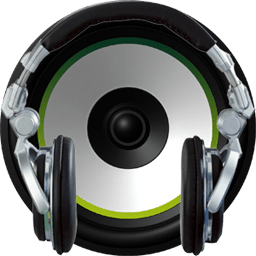 Audio files can be added in bulk to a playlist via the Browse button or by simply dragging and dropping MP3, WMA, WAV and MID files - or even whole folders with audio files - directly into the Audio Files list box. The playlists created here are shared with the Media Player internal command. Each alarm can optionally use its own volume and LCD brightness settings, or use the global settings defined in the Wake-Up tab. If you like waking up with music, you can define an alarm that starts playing softly and slowly increases the volume over time. Likewise the brightness of the alarm LCD screen can be slowly increased so it doesn't hurt your eyes when you wake up in darkness. Slide-in setttings were added to the 'Show a Reminder' panel in the Alarm Editor panel so alarms can either use the Wake-Up settings defined above or have individual volume, brightness and snooze setttings. Likewise you can also color code individual LCD alarms. 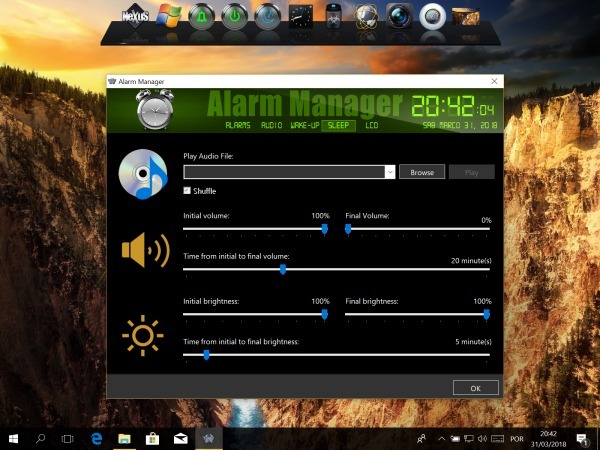 For those who like to fall asleep while listening to music, there is a 'Sleep Timer' internal command which uses the settings defined in the Sleep tab of the Alarm Manager. 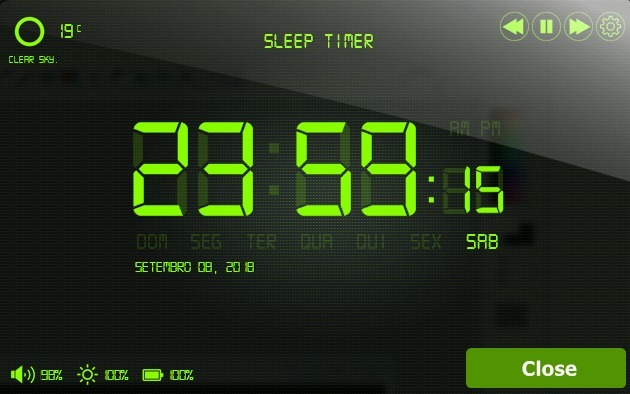 You click on the Sleep Timer icon as you go to bed and a full screen LCD clock display pops up. Volume and brightness decrease over the pre-defined time until the full screen clock finally closes when volume reaches zero. Variety is the spice of life, as they say. 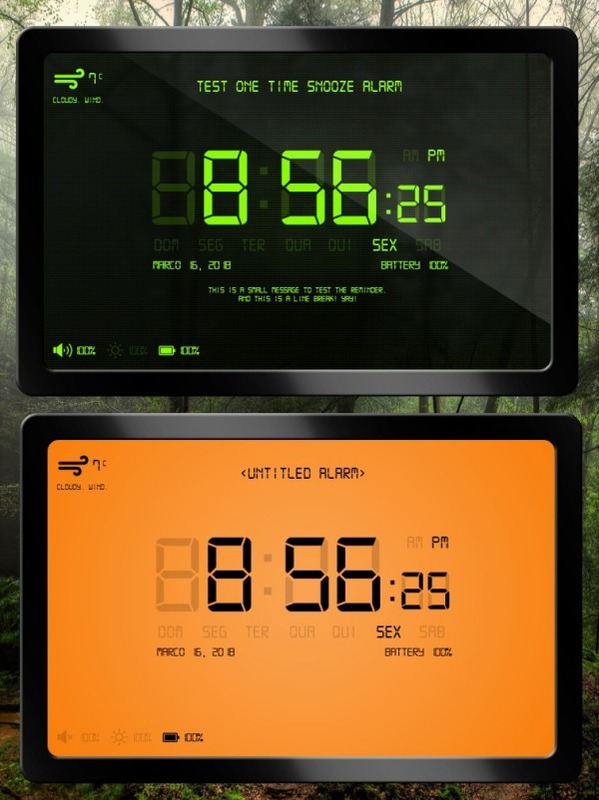 You can choose one of a handful of pre-built skins and bezels for your LCD alarm reminders in window mode. Besides the default glass reflection, you can also select between 18 different cool overlays for your alarm reminders, or even set the alarms to use a random overlay each time. In addition to this the alarm reminders can optionally feature an animated rain drop effect with associated sound effects. You can also specify different foreground and background colors for the LCD displays. Moving the mouse pointer over an alarm window smoothly fades the control buttons in, and you can skip tracks and pause the music. Clicking the settings button allows you to change volume, brigthness and the snooze duration directly. 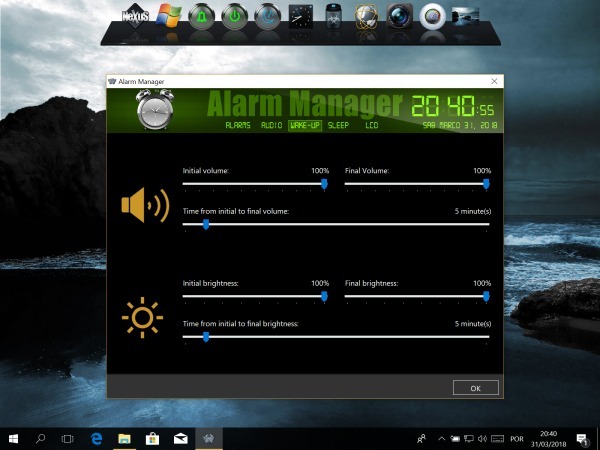 Double clicking the alarm toggles it between full screen and window mode, and the scroll wheel on your mouse can be used to control either the volume or the brightness of the LCD display, as defined in the LCD tab of the Alarm Manager. You can also control the audio using the media keys on your keyboard. The CD-Control internal command allows you to see at a glance what type of media is currently inserted (if any) into a removable drive. It also allows you to open and close the drive's drawer (where supported by the hardware itself) by clicking on the icon. The drive monitored by the CD Control internal command is defined as the argument in the Item Properties dialog of that item. The Capture Desktop internal command can be used as a quick way to save a screenshot of your desktop in either JPG or PNG formats with an automatically generated filename. Right clicking the Capture Desktop icon and selecting Capture Desktop Settings from the context menu that pops up gives you access to the settings panel for this command. In the settings panel you can specify which format is used to save the screenshot, compression level, and where the screenshot is saved to (by default it's saved to the Windows Desktop). 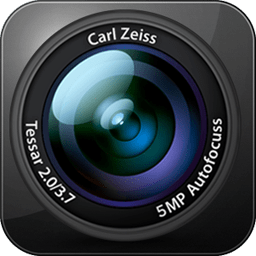 You can also specify a delay between clicking the icon and the screenshot being taken - this can be very useful to give you enough time to prepare the screenshot. When a delay is specified a countdown will be displayed in the icon itself. You can interrupt the process by pressing the ESC key or clicking on the icon again. A ticking sound is played every second when the countdown is active, and when the screenshot is taken a shutter sound is heard. The sounds for these events can be defined in the Sounds tab of Preferences, and sounds for the Capture Desktop internal command can be disabled in this settings panel. If the ALT key is pressed while clicking on the Capture Desktop icon, a screenshot will be taken of the current foreground window instead. The Winstep application is essentially a program launcher and a Windows user interface add-on/enhancement. As such, it should be available to you, fully functional, at exactly the same time as the Windows Desktop. Unfortunately since Windows Vista the OS has been cheating to make itself look better: Microsoft deliberately delays the loading of 3rd party applications for Windows to appear to be booting faster than in previous versions, but at the expense of everyone else. Windows 10 is by far the worst offender: it deliberately delays the startup of 3rd party applications by several seconds. In version 16.6 we added a new 'Fast Boot' setting in Preferences that solves this problem - however, in part because it uses undocumented ways to accomplish this goal, we have left this option disabled by default. It is thus up to the user to decide if he wants the Winstep application to start before all other applications or not - which is as it should be. Unfortunately this didn't put a stop to users complaining that the Winstep application was taking too long to startup. We figured this happened because users either didn't notice the Fast Boot setting in Preferences or they didn't know what it did. We thus decided to put the 'Fast Boot' option right in front of the user's nose by adding a 'Fast Boot' internal command to the default dock on Windows 10 systems. The only thing this command does is toggle the Fast Boot setting, and the same can be accomplished by toggling the setting with the same name in Preferences - but this at least ensures users know it's there. It also displays on mouseover an explanation of what it does and why it's needed. Evidently, once you've turned Fast Boot on - either by using the internal command itself or in Preferences - you don't really need that icon taking up space on your dock, so you might as well remove it. The Language Bar internal command can be placed anywhere and emulates the functionality of the Windows language bar. The Language Bar provides a quick way to switch between language inputs or keyboard layouts, as well as allow you to visualize which are currently selected. This is the same technology used to automatically determine your location for the Weather module when you run the application for the first time. They are: Media Next, Media Pause, Media PLay, Media Previous, Media Stop Media Volume Down, Media Volume Up. 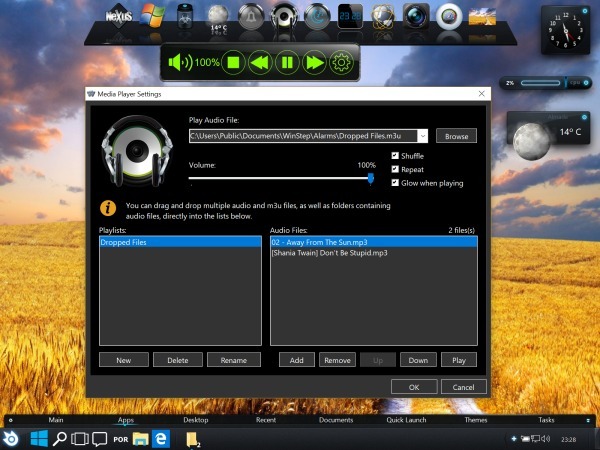 The Media Player internal command adds a very quick, convenient and unobtrusive way to listen to your favorite musics at the click of a button without having to open a full blown media player. One click on the Media Player icon starts the music playing, a second click pops up a media control bar from where you can pause and stop audio, skip tracks and configure the Media Player. When the media control bar is open, volume levels can be adjusted with the scroll wheel of your mouse. The music being played and respective playlist appear in the icon's label and balloon tooltip, and you can select tracks and playlists directly from the right click context menu. 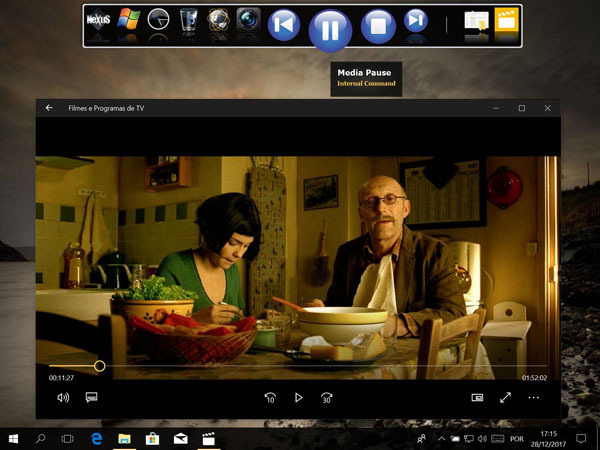 The media control bar offers full support for keyboard navigation and the Media Player can be directly controled using the media keys on your keyboard even when the control bar is closed. You can also use the built-in media control internal commands for this. 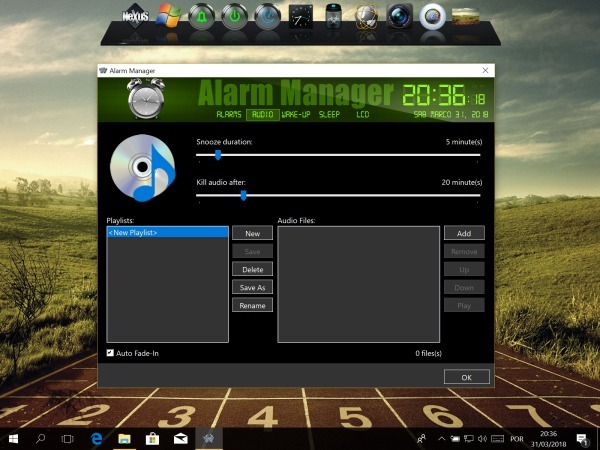 The Media Player internal command is very simple to use and uses the same playlists defined for the Winstep Alarms so you don't have to set both up independently. Playlists are automatically saved and support drag and drop of .m3u files, media files and even of folders containing audio files. You can drop these directly on the Media Player icon too, and it will play them automatically. Eye candy is a huge component of Winstep applications. Unfortunately keeping all those nice animations, effects and system meters going has an impact on CPU usage, which, in turn, increases energy consumption - not a problem if your system is a desktop running on AC Power, but a potential runtime limiting factor for laptops running on battery. 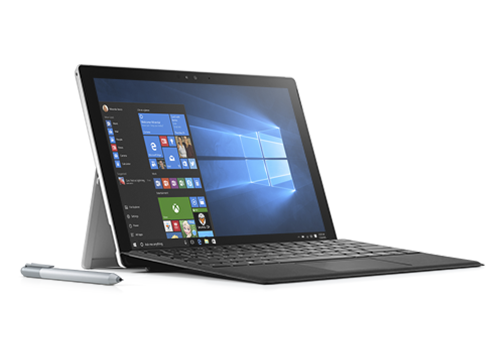 Winstep applications include two 'Power Saving' modes (Normal and Ultra) designed to extend your laptop or tablet's battery life. 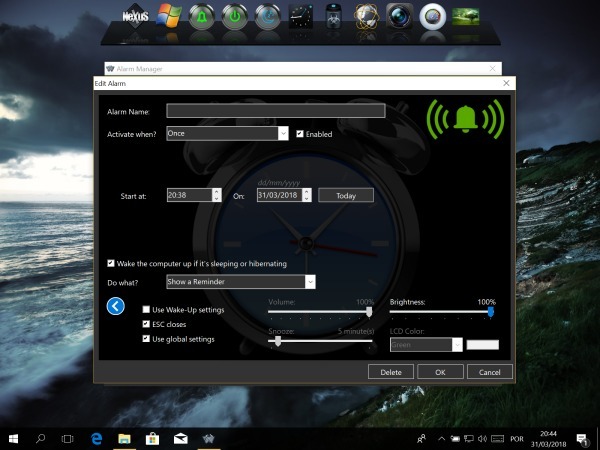 These power saving modes can be enabled manually via the 'Power Saving' internal command or automatically when your PC's battery runs low, when Windows 10 activates the 'Battery Saver' mode, when the screen goes into standby, when a full screen application is running, or based on a combination of the above. 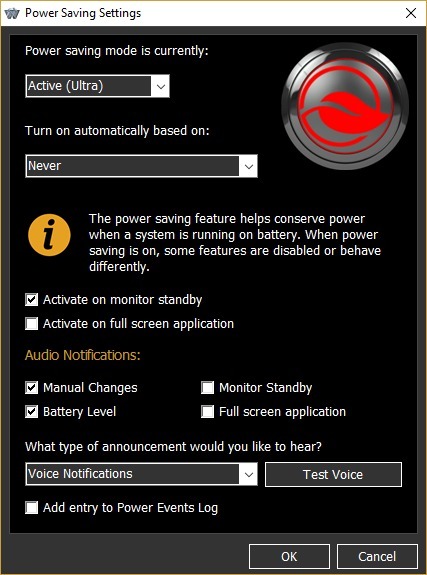 Voice notifications are used to warn the user when the current power saving mode changes, but these can be turned off if required or only enabled for specific events. The icon itself is grayed out if power saving is off, green if normal power saving is on, and red if ultra power saving is on. On tests, the normal power saving mode reduced CPU usage of the Winstep application - and therefore power usage - by up to 75%, and ultra mode manages to extend this a bit further. This is mostly accomplished by reducing the polling/update rate of all the meter modules and disabling all non-essential cosmetic animations. 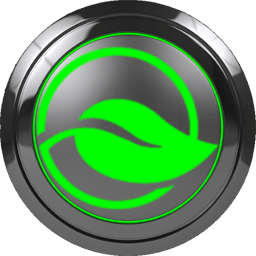 For instance, in Ultra mode modules are only updated once every 4 seconds, opposed to 2 in normal power saving mode and every second when the power saving mode is disabled. 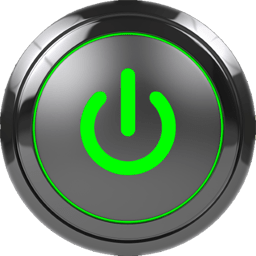 Normal power saving mode does not disable the all-important icon mouse over animations (Ultra power saving mode already does that for maximum savings), so it can even be automatically enabled as soon as the laptop starts running on battery without much impact on the user experience. Modules update only once every 2 seconds instead of every second. Clock module is only updated once per minute. Analog clock stops displaying seconds hand. Clock stops synchronizing the time with the Internet Time servers. Clock stops announcing the time and/or playing the tick sound. Wanda stops the swiming animation. Wanda preview in the Wanda Settings dialog stops animating. Rotating globe style of the Email Checker module stops rotating even if there is mail. Smooth gauge needle animations are disabled. Battery module charging animation is disabled. Flip calendar day switching animation is disabled. Moon module is only refreshed once per hour instead of every 3 minutes. Moon preview animations in the Moon Module Settings dialog are disabled. Star background in the Moon Calendar dialog stops moving. Intermediate frames to smooth out moon animation in Play mode are disabled. Moon phases/zodiac Signs rotate animation in the Moon Calendar dialog is disabled. Alarm Manager top header only updates the time every minute. Alarm Reminders only update the time every minute. Battery preview in the Battery Setttings dialog stops animating. Glow animation in the Battery module Info dialog is disabled. Text animation is the About tab of Preferences is disabled. User Interface slide animation is disabled. Theme previews fade in/out animation is disabled. Module preview animations in Preferences are disabled. Network data in the Net Meter Settings dialog updates once every 2 seconds. Network Statistics dialog only updates once every 2 seconds instead of every second. Network Active Connections dialog updates once every 2 seconds instead of every second. Most Active Programs History dialog is only refreshed once every 2 seconds. Performance data about running processes is only retrieved once every 2 seconds. Running indicators on docks are only refreshed once every 2 seconds. Shelf smooth scrolling is disabled. Smooth icon shifting when dragging items over a dock or Shelf is disabled. Shelf Hide and Expand animations are disabled. Sub-dock opening animations are disabled. Dock Hide and Show animations are disabled. New Item (rise) animations are disabled. Item removal animations are disabled. Thumbnail/icon change fade in/out animations are disabled. Animated icons set to animate permanently now only animated on mouseover. Animated icons no longer finish the animation when the mouse pointer moves away. Water Ripple effect is disabled. Rain Drop effect is disabled. Raind Drop effect audio is disabled. Menu and sub-menu opening animations are disabled. Smooth text scrolling is disabled and scrolling text in desktop modules is only scrolled once per second. Fast System Tray Refresh is disabled. Pulsating icon effect (Ghost) on icons when audio is playing is disabled. Flashing 'Pause' symbol overlay when the Media Player is paused becomes fixed. Slide animations in the Effects Panel are disabled. Effect slide animation in the Effects tabs when clicking the arrows is disabled. Pause between effect repetitions in the Effects tabs becomes 1200 ms instead of 600 ms.
Modules update every 4 seconds instead of every second. Network data in the Net Meter Settings dialog updates once every 4 seconds. Network Statistics dialog updates every 4 seconds instead of every second. Network Active Connections dialog updates every 4 seconds instead of every second. Most Active Programs History dialog is only refreshed once every 4 seconds. 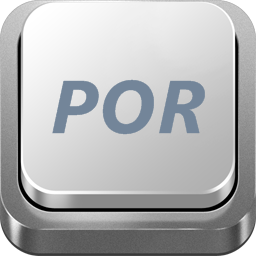 Performance data about running processes is only retrieved once every 4 seconds. Running indicators on docks are only refreshed once every 4 seconds. Animated icons no longer animate, not even on mouseover. Mouseover effects combined with Magnify on docks are disabled. Mouseover effects on the Shelf are disabled. Pause between effect repetitions in the Effects tabs becomes 2400 ms instead of 600 ms.
For those who like to fall asleep while listening to music, there is a 'Sleep Timer' internal command. The Sleep Timer uses the settings defined in the Sleep tab of the Alarm Manager.